It’s the most wonderful time of the year—the holiday season, a chance to give back to the community. The Railers have wrapped up another busy season of giving, and it was all highlighted Saturday night on our Nonprofit Awareness Night, with a total of forty thousand dollars being donated to local nonprofits courtesy of the Railers HC Foundation. The boys pulled out a 5-3 win over Reading for a nice treat before the holiday break. And now that we are on holiday break with a new year on the horizon, we wanted to take this time to reflect and look back at some of the great community work we’ve been privileged to be a part of this year. Below, you can find a complete breakdown of the nonprofits, charities, and organizations we’ve worked with this holiday season. For more info on this year’s Season of Giving, click here. Winter Clothing– Winter scarves, hats, and gloves were collected for donation to Andy’s Attic. Andy’s Attic will be distributing these to families displaced by recent fires in Worcester. North High School will also receive a winter clothing donation. Food Drive– The Railers, along with Price Chopper Market 32, put on a food drive before our game on December 14th. The Railers will triple the collection and donate everything to the Worcester County Food Bank on a later date. 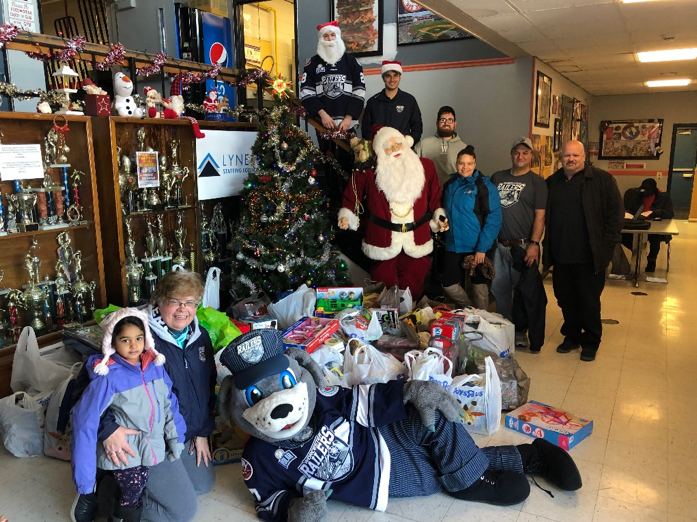 Toy Drive– The Railers teamed up with the Worcester County Sheriff Department and the Fidelity Bank Worcester Ice Center to host the Second Annual Toy Drive and Public Skate. Railers HC players Malcolm Gould and Kyle McKenzie visited Target and purchased over $500 worth of toys to be donated to the Friendly House, Guild of St Agnes, and Boys and Girls Club of Worcester. In addition, the Railers Booster Club donated over $3,200 worth of toys to the Friendly House. Teddy Bear Toss– The Railers hosted their first ever Teddy Bear Toss during their December 15thgame. Hundreds of stuffed animals were donated to families at the Friendly House. Trax appeared at the Friendly House’s Annual Christmas Party to drop everything off and meet the kids. 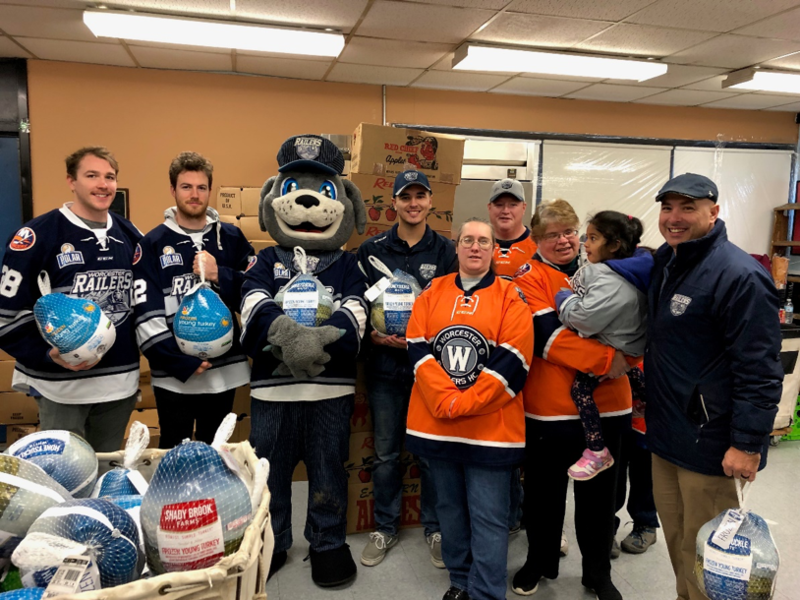 Turkey Distribution– The Railers volunteered at the Friendly House on November 21stto help distribute Thanksgiving meals to local families in need. Holden native Connor Doherty, Railers staff, boosters, and the Rucker family volunteered. Ava Roy Fund– The Railers hosted a Fill the Boot Night to benefit the Ava Roy Fund on December 21st. All Worcester fire, police, and first responders received free tickets at the DCU Center Box Office courtesy of Feeley Dental and the Railers HC Foundation. Members of the Worcester Fire Department collected donations upon entry to the game. The Railers HC Foundation donated $5,000 in addition to the Chuck a Puck and 50/50 raffle proceeds. For more info, click here. Railers HC Library Makeover– The Railers HC held a reading program at the new Lake View Elementary (Worcester) library on November 29th. Over the summer, Railers staff worked on renovating the school’s library. The new library, thanks to Cutler Associates, Unum, NALS Paint Center, Sunshine Sign, and Chick Fil A, looks like the inside of the Railers locker room and has brand new furniture! 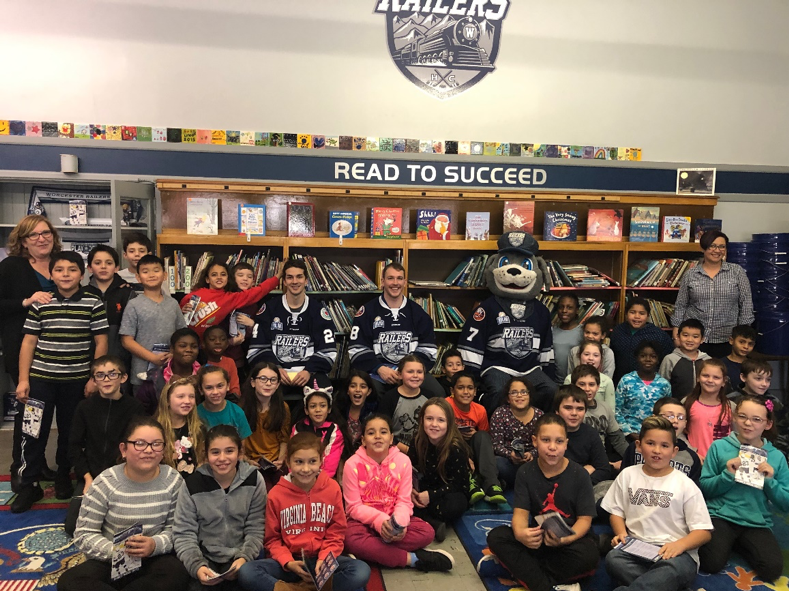 Railers d-men Connor Doherty and Tyler Mueller read to the students and held a Q & A. Vernon Hill has been chosen as the next library the Railers HC will work on renovating! Cancer Research– Jr Railers player Dante Sousa raised thousands of dollars for cancer research. For more info, click here. Backpack Stuffing– The Railers Booster Club purchased school supplies over the summer and filled over 60 backpacks with school supplies. These were donated to the Friendly House and distributed to local kids in need. Ornament Drive– The Booster Club raffled off player signed ornaments at games on Dec 21st and Dec 22nd to raise money for the Mike Ellsessar Scholarship Fund. These ornaments were hand-crafted by members of the Booster Club. In 7 previous years, the Booster Club has raised a total of over $7,500. Skate to Success– Year two of Skate to Success started mid-September. This year, over 2,000 new students will participate in our flagship learn to skate community program. Each week, fourth graders from each Worcester Public School learn how to ice skate from Railers players, coaches, staff, and volunteers at no cost to the school or students thanks to Hanover, Fallon, CCM, Niche, and WBDC. New this year, every Skate to Success graduate can apply for a Railers Learn to Skate scholarship. 50 scholarships will be available and will include gear and learn to skate tuition. Trax Appearances– Trax has been the busiest Railer appearing in over 100 events since the summer has ended. He’s visited town festivals, schools, and non-profit events such as the Big Brother Big Sister Holiday Party and Worcester Common Oval Tree Lighting Ceremony! For info on how to book TRAX, click here. Ugly Sweater Night– The Railers HC wore (not so) Ugly Sweaters on December 15thand raffled them off postgame. We raised thousands of dollars for the Shine Initiative! Donations– The Railers HC Foundation has donated over 250 Ticket Certificates and Prize Packs to local 501c3 organizations to raise money for various causes. For more info regarding donations, click here. 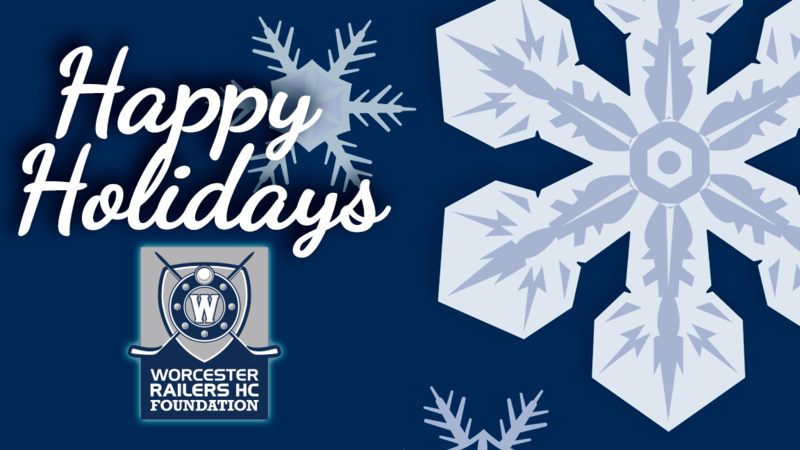 The Worcester Railers HC Foundation was established to support the youth and families in the greater Worcester community and throughout Central Massachusetts. The Railers HC Foundation aims to provide access to sports and art programs throughout the region and is eager to team up with other community-based organizations. 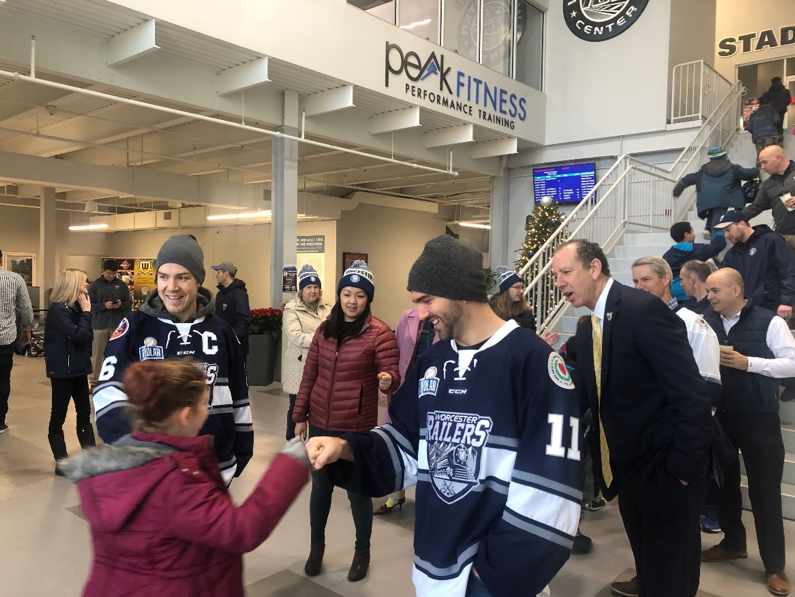 For more information on the Railers HC Foundation and all community initiatives, contact Community Relations Coordinator Paul Harris at paulh@railershc.com.